In our pre-Baberoo days, when we lived in London, Oxford Daddy and I used to enjoy an occasional visit to Banana Tree, which had a delicious Indochinese menu and laid-back vibe. So when this small chain of 8 restaurants opened a new branch in Oxford (63 George Street, OX1 2BQ) in December I put it on my list of places I really needed to try – although we only managed to get there last weekend. Life moves fast with a three-year-old and what with nursery school and other activities we don’t have time for many lunches out any more! Although the menu has changed quite a lot since we last visited a Banana Tree, it still offers the same kind of out-of-the-ordinary Southeast Asian fare. As a newly-minted vegan (yes, my foodie friends! I am now VEGAN! ), I was thrilled to be handed, as a matter of course alongside the regular menu, a special vegetarian and vegan menu that offered at least eight starters and mains I could eat, as opposed to the paltry selection in many other restaurants. I started with the Street Style Crispy Dough (£3.95), which was kind of like morsels of non-sweet doughnut with a satay sauce on the side. I enjoyed the first few bites, but it was a bit too deep-fried for my taste and I couldn’t eat the whole thing. The Blackened Monks Noodles (£9.65), on the other hand, were so tasty that I ate every last bite of the noodles, the lovely crunchy vegetables, and the sweet corn cakes that came on the side, and then wished that my tummy was empty so that I could order it again right away. Yum! The Baberoo, after repeatedly asking why there was no pizza on offer (I think she’s under the impression that pizza can be procured at every restaurant), seemed as if she was going to balk at any of the choices on the kids’ menu (main, drink, and dessert for £5.95), but when her noodles with bean sprouts arrived she happily ate them and told us they were delicious. She also liked my crispy dough. She didn’t touch much of her corn cakes, but Oxford Daddy helped her out by eating those himself. Of course, she got her second wind when the ice cream arrived (ahem, I fear that after sampling so many kids’ menus in aid of the Oxford Mommy blog, she’s also under the impression that ice cream comes after every restaurant meal)! The service at Banana Tree couldn’t have been better. Our servers were all personable and attentive, took the time to chat with us, and seemed to really enjoy their work. It was clear they had mastered the art of serving customers promptly and quickly without seeming rushed or harried, even during a busy Saturday lunchtime. So, top marks for service, food, and general enjoyment of our meal. Now let’s see how they rate for baby- and toddler-friendliness using my usual 5 rating categories of menu, space, ambiance, facilities, and feeding. Menu: For parents who are eating while holding a baby or child for any reason, there are lots of starters and mains that you can happily eat with only one hand available. In fact, most of the menu lends itself to eating one-handed, which is characteristic of many Eastern-inspired restaurants. From noodles to curries, you’re covered. Space: There’s not too much space between the tables, and with the exception of one wide route through the restaurant, everything else is a bit close together to handle a buggy. We parked ours at the front of the restaurant in the waiting area, which, thankfully, wasn’t heavily populated. At very busy times, though, there wouldn’t be too many areas in the restaurant that could fit a pushchair. Ambiance: Because we had such great service, we felt like the restaurant was extremely welcoming and friendly. The decor was both minimalist and maximalist – a stripped-back industrial feel but with giant (and I do mean giant) lamps (that were perhaps bells in a former life?) hanging over the main communal table. Babies and toddlers will really enjoy looking at those because they’re just so darn big, and they will also be enthralled by the stuffed apes hanging from the ceiling, so try to get a seat where they can be amused by the eye candy. 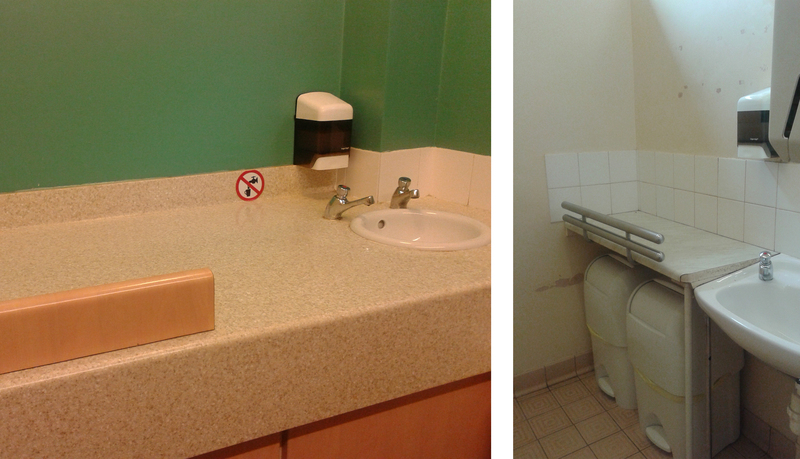 Facilities: The baby-changing facilities, located within the disabled toilet, are brand-new so are very clean and fresh. The pull-down table is a good size and has a bag hook, but if you want to actually rest your diaper bag on a surface there’s only a small shelf somewhat far away from the table, along the wall with the toilet. For kids old enough to be using travel potties, the floor space is large enough to comfortably help a little one without feeling like you can’t move around or bend down. It would probably fit a stroller, although you wouldn’t be able to manoeuvre one through the restaurant. Feeding: If you’re breastfeeding at your table, you’ll be sitting on either a wooden bench or a wood-and-steel chair, neither of which are the most comfortable when feeding, but the industrial decor means there are no padded chairs or squashy sofas to retire to. If your little one is older and is ordering from the kids’ menu, there’s a choice between two bases (rice or noodles) and then between two toppings (chicken or corn cakes). Not that many options, then, but most kids will like something there. Out of a possible 10 points, Banana Tree scores a 7.25 for baby- and toddler-friendliness. The service is great and the food is well worth coming back for, but there’s less space than you might need to accommodate a stroller and all your baby accoutrements. I’d say that although it’s a real contender for one of my top places to go on the busy George Street restaurant circuit, it’s better for little ones who are past the baby stage. Apparently I have been living on another planet for the last few months because I hadn’t heard about the grand opening of Thaikhun (36 George Street, OX1 2BJ) in April. I only noticed last week that it had replaced Cleaver on busy George Street, and made a mental note to visit ASAP, since Thai is one of my favourite cuisines. So during a jam-packed day of museum-visiting and errand-running, we stopped at Thaikhun for lunch. My foodie friends will probably be aghast to know that I have become (or rather, re-become) vegetarian this year, and I admit it has made it more challenging to dine out – but I was pleasantly surprised by the fact that the menu had a whole vegetarian section. (However, I also was disappointed not to be able to partake of many of the delicious-sounding other items on the menu!). 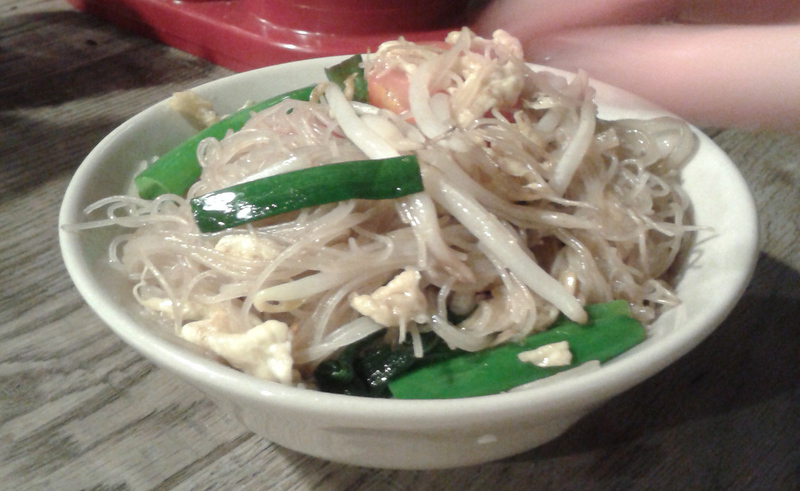 I always judge a Thai restaurant by its pad thai, so for me the Pad Thai Jay (£7.95) was required eating. I also ordered the corn fritters (£4.25) to share with Oxford Daddy. The fritters were extremely tasty and moreish, with a good dose of kaffir lime leaf. The pad thai was good, with a flavourful sauce that was just a bit too sweet. I wasn’t partial to the big, crunchy chunks of cabbage in it – I’d have preferred smaller slivers cooked more thoroughly. To accompany the meal I had a Thai iced tea (£2.50), made with condensed milk and topped with whipped cream. Naturally, the Baberoo kept requesting sips, but I only permitted her a small amount because I’m pretty sure the caffeine content was sky-high! This is one of the only Thai restaurants I know of that has a kids’ menu, and it’s a great one, with four mains reasonably priced from £4.25-£4.95. No cop-outs here – all dishes have authentically Thai flavours. Some are mini-versions of the adult dishes (classic Pad Thai; barbecued pork with sweet BBQ sauce), while others are Thai versions of classic children’s menu offerings (Bangkok popcorn chicken, a much classier take on chicken nuggets). The Baberoo got the Nong Noo Guy Noodles (£4.25), egg noodles with sliced chicken breast, carrots, and beansprouts. She actually received two bowls of noodles – our original order came after she had mistakenly gotten the next table’s noodles with cherry tomato, beansprout, and egg. We kept both and she enjoyed both of them. Service was friendly and extremely prompt, and despite the wrong order being brought to our table I got a clear sense that they were aiming to please and correcting mistakes right away. One item from the menu wasn’t available, which was disappointing, but food-wise, I was pleasantly surprised. I had thought that it would be run-of-the-mill, but it was better than expected. I’m looking forward to going back and sampling more of the menu. Now, here’s how it rates for baby- and toddler-friendliness, according to my five criteria of menu, space, ambiance, facilities, and feeding. Menu: For those who need to hold a baby in one arm while eating with the other hand (or, like me, who need to eat with one hand while using the other to fend off a child who is alternating between head-butting you and throwing her arms around you exclaiming ‘Mommy, you’re my best friend!’), this menu offers plenty of one-handed choices. Most of the mains (excluding some of the grills) and most of the starters and salads can easily be eaten with one hand, and you also get the choice between chopsticks and traditional cutlery. 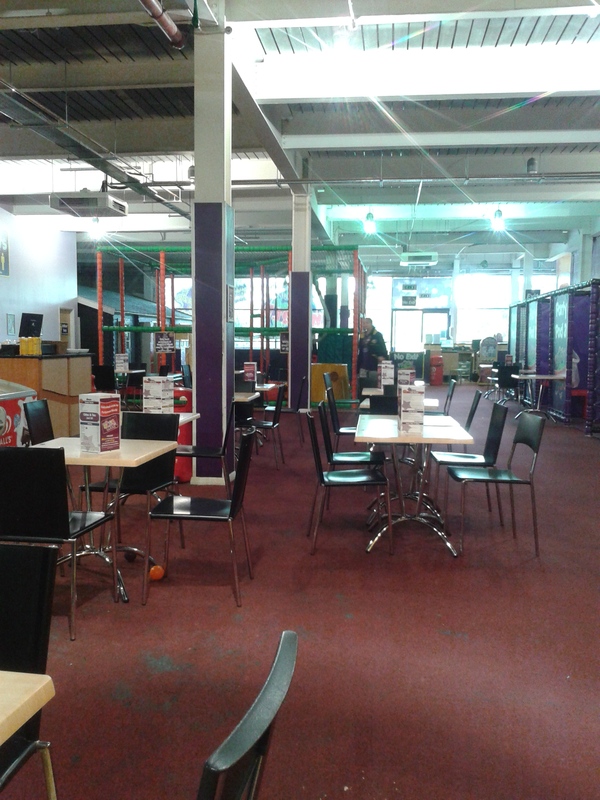 Space: Most of the seating is downstairs in the basement level, although there are some tables on the ground floor. If you’re happy to do so, you can leave your pushchair behind the welcome desk and in other corners near the front of the restaurant. If you need to bring it to your table, there are some spots on the ground floor where it wouldn’t be in the way and it wouldn’t be too difficult to manoeuvre through the restaurant, although it’d be easier with a smallish stroller. 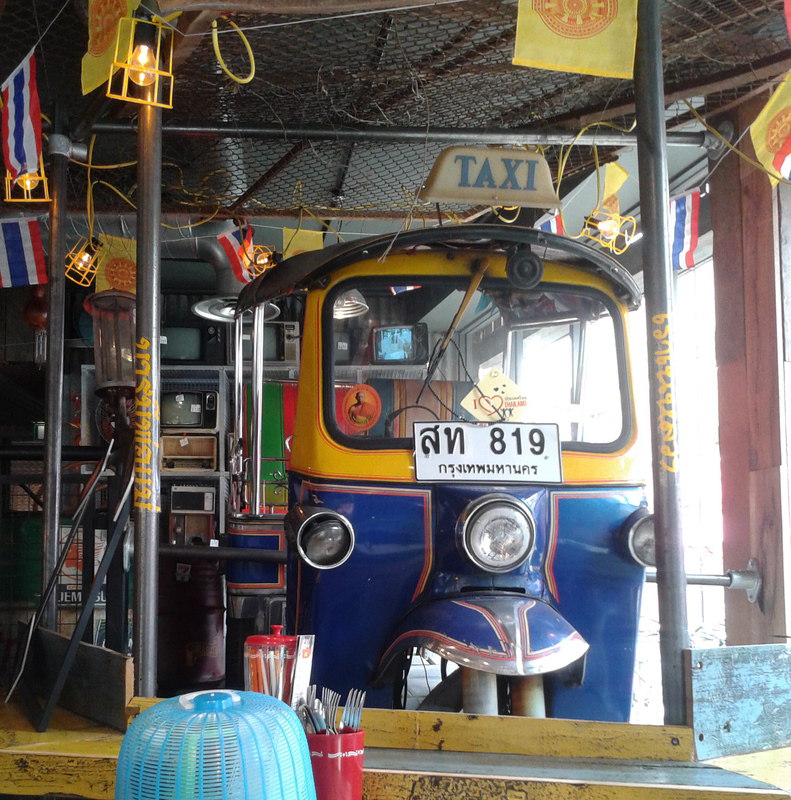 Ambiance: There’s some amazing decor in Thaikhun, including a Thai taxi right at the door and lots of banners, canopies, lanterns, crates, posters – plus Thai graffiti on every conceivable surface. 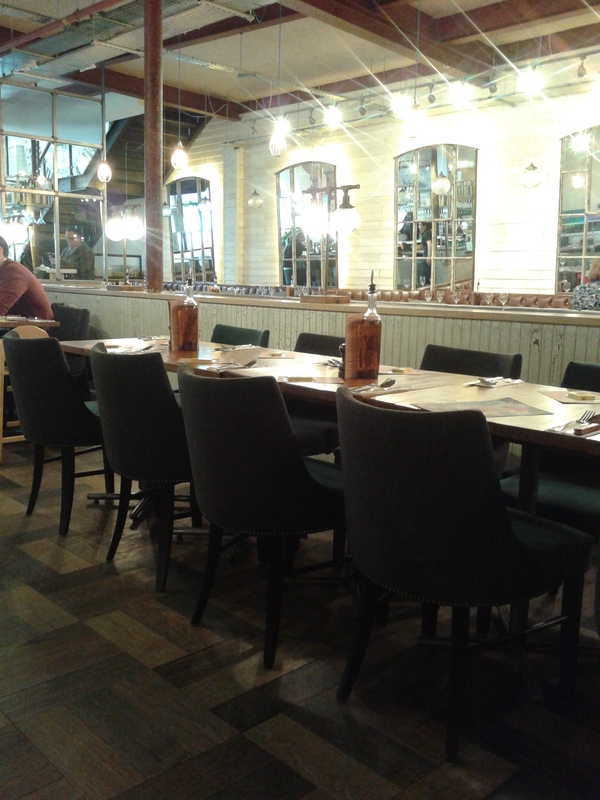 They’ve even got boats hanging from the ceiling and also made into benches at one table. They’re all from Thailand and they add so much character to the restaurant that already when you walk in you’re excited to be there. For smaller babies the visuals will be mesmerizing – although they could also be overwhelming, and the cheery loudness of the place will be too much for some babies to sleep through. The Baberoo enjoyed bopping around to the music (which was one of the only things in the restaurant that wasn’t Thai). The service is extremely friendly, and we had many servers come by our table and speak to the Baberoo. Kids are definitely made welcome. Facilities: There are regular toilets in the downstairs seating area and a disabled/baby-changing toilet on the ground floor. Both sets of toilets require you to go up a few steps, so you wouldn’t easily be able to bring your stroller in with you, which is a definite drawback if you need it or you don’t want to leave it unattended at your table. The baby-changing facilities on the ground floor are fine and reasonably spacious. Since we were in the downstairs seating area and had brought our potty with us, we just used the regular toilets. The stalls are too small to get into if you are helping a little one down on the floor (and probably would be a tight squeeze if you brought a portable toilet trainer seat that fits right on top of the regular toilet – you’d probably have to keep the stall door open in order to move around comfortably). 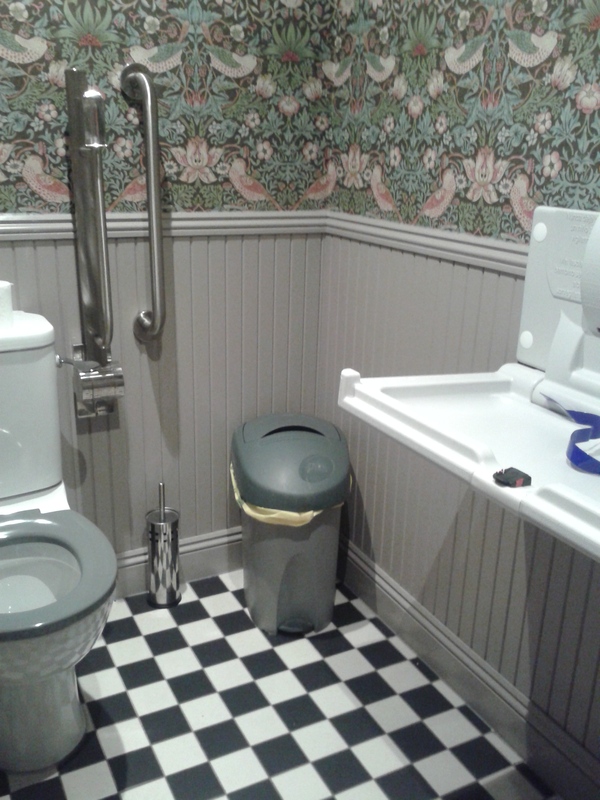 But since the sink/mirror area was spacious, we just put our potty outside the stalls where the Baberoo could look at the colourful array of posters on the walls and we’d be out of the way of other patrons who needed to use the stalls. It worked fine. Feeding: As mentioned above, the kids’ menu is great for those who are eating solid foods, especially if they are adventurous. Those who balk at anything but standard fare might not do so well here. 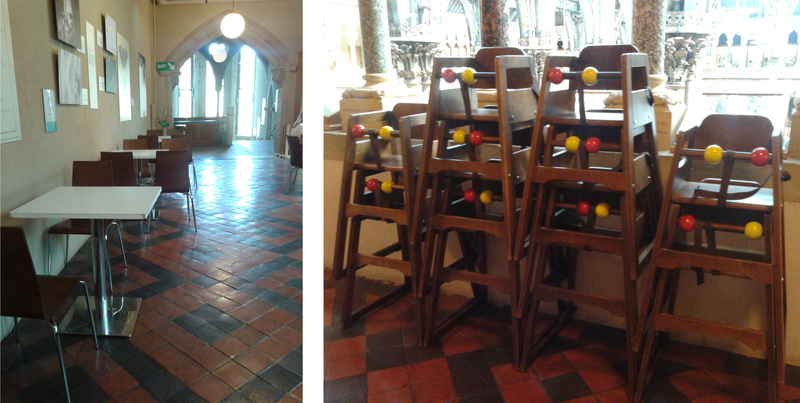 There are plenty of high chairs for those who need them. Breastfeeding mothers can choose between bench seating and chairs. Benches are padded; chairs are not, but since they are artfully mismatched you could probably take your pick of whatever chair looks most comfortable to you, and swap with another table if yours doesn’t have one of that type. In total, Thaikhun gets a 7.5 out of 10 for baby- and toddler-friendliness. For an energizing, cheery atmosphere and interesting kids’ menu choices, this is a tasty place to dine with your little one. 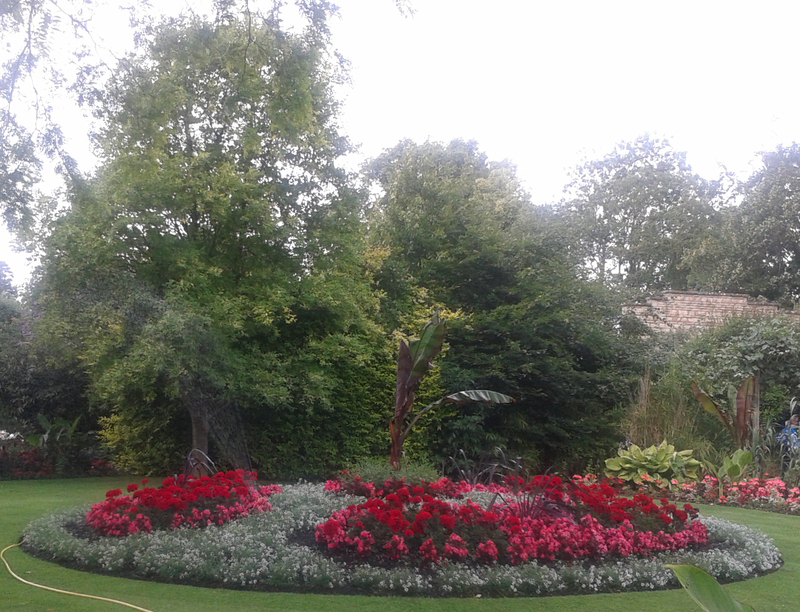 We are often in Wantage to visit the Baberoo’s grandparents, so we like to go out and discover its activities and eateries. Fairly new to town is the 8th branch of the Wildwood Kitchen (43 Market Place, OX12 8AW), which has claimed a prime location in the town centre. 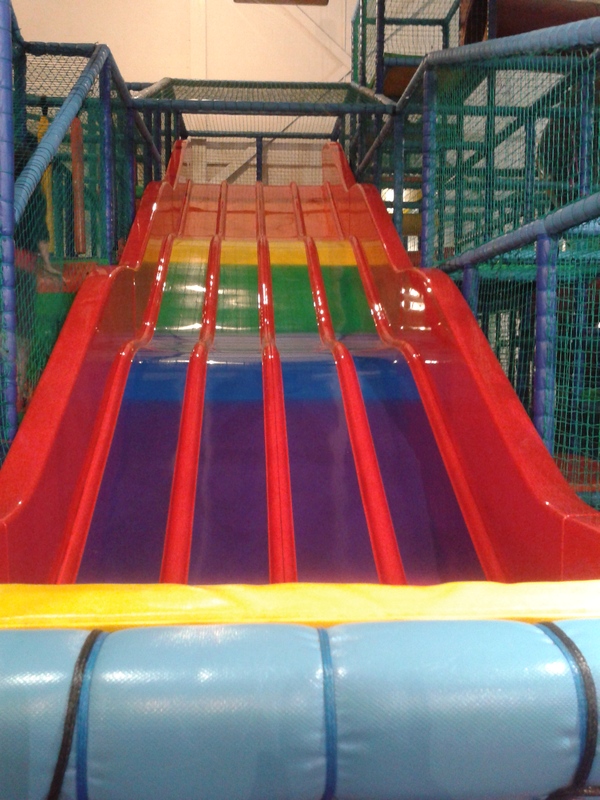 On a recent trip to Wantage we thought we’d give it a try along with the Baberoo’s Gran and see how it rated for baby- and toddler-friendliness. I was feeling virtuous so ordered three salads as a selection from the deli menu. 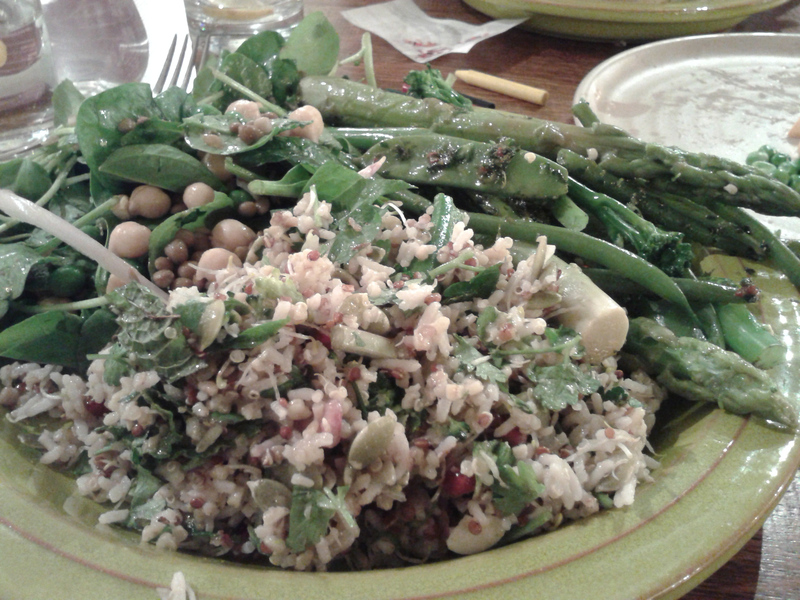 All were delicious, with the grains cooked al dente and the greens very fresh. 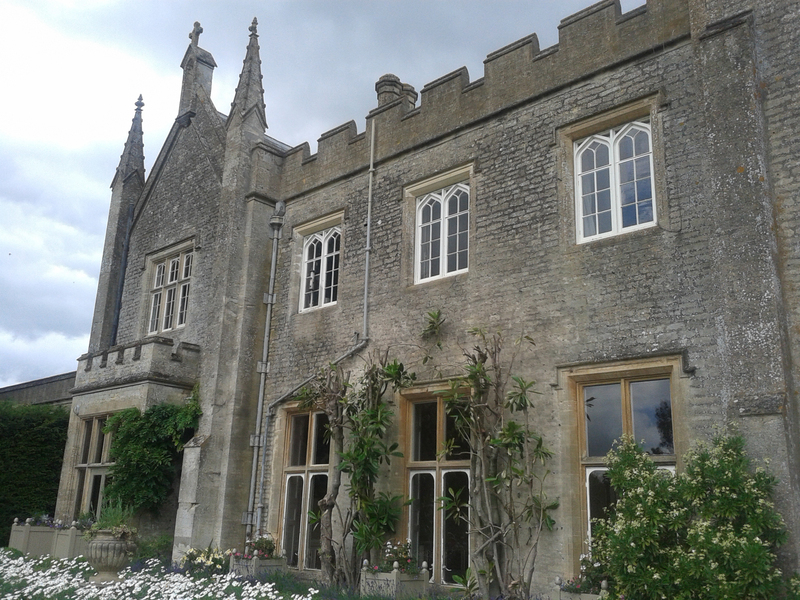 There were no dressings at all on them – which I appreciated since I rarely like dressings – but it would have been nice to have several slices of lemon available if I’d wished to season them. 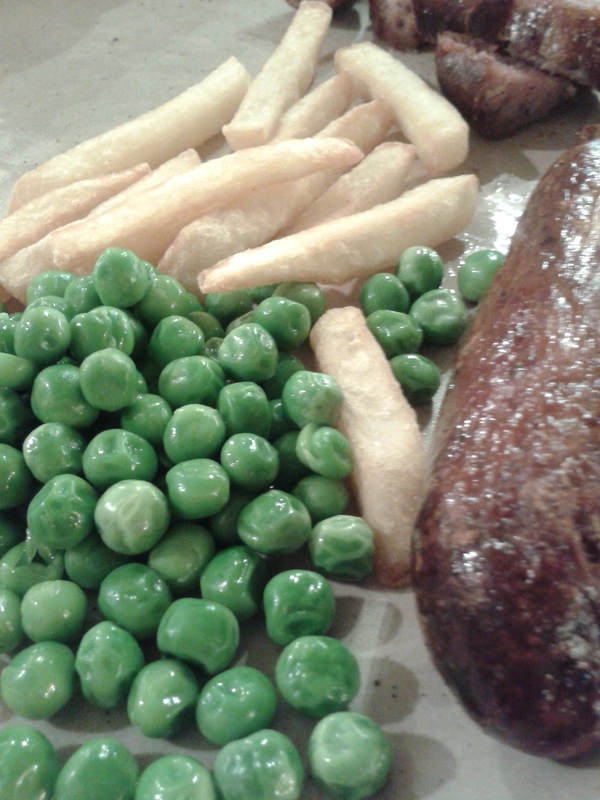 For the Baberoo I ordered the sausages, chips and peas from the kids’ menu (£4.75 for main and dessert, with 80p supplement for a drink). Although she didn’t eat much of the sausages, she wolfed down the chips (which always seem to take priority over everything else!). Service was a bit choppy – we had at least five different staff members approach our table for various reasons, which made it seem like they weren’t coordinating with each other very well. It didn’t affect our enjoyment of the meal, but it did give the restaurant a greenhorn kind of feel which didn’t match with the swishness of the surroundings. Menu: The menu at Wildwood includes many pastas and risottos, most of which can be eaten with one hand if you’re holding a baby in the other arm. The pizzas and meat dishes would be more difficult. If you’re looking for a salad, order from their deli menu – it’s got a rotating selection and the salads are all certainly possible to eat with only one hand free. Space: This is one restaurant where you’ll never have trouble manoeuvring or parking your baby carriage, even if it’s enormous. There’s so much space between tables that you could still wheel your buggy through the aisles even if all the seats are taken. There are also several useful corners, cubbyholes, and niches in which to park your pushchair. When we visited, only about half the tables were full, but I counted seven parked strollers (including ours), all of which were ensconced safely without blocking or impeding anyone’s path through the restaurant. The only small niggle is that getting into the place requires opening a fairly heavy door and then pushing your carriage up a short incline. Ambiance: Industrial decor tempered with wood and leather. The high ceilings and beautiful lighting really make this open space seem welcoming and the heavy wooden table of goodies/deli items at the front definitely draws the eye in from outside. Staff are generally friendly and some of the servers we encountered took the time to talk to the Baberoo. 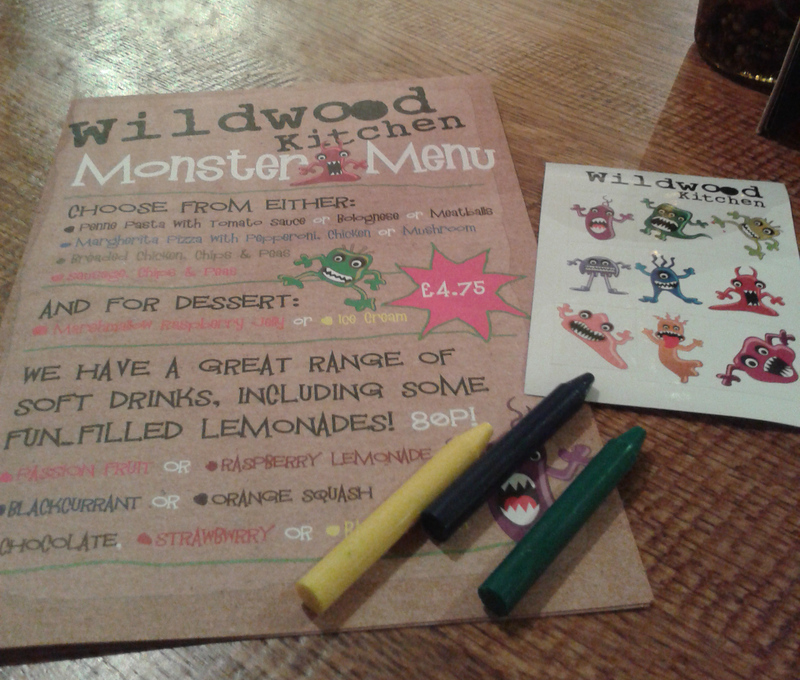 There’s also a colouring book with stickers for kids to amuse themselves with before the meal arrives. Facilities: The baby-changing/disabled toilet is well located on the ground floor, and is spacious enough to fit a pushchair in with you. The pull-down table is the narrow variety. It doesn’t have windows and the lighting seems a bit dim, but the pretty wallpaper and cleanliness make it quite a pleasant bathroom to use for a diaper change. Feeding: If you’re breastfeeding, you have a choice of leather-upholstered booth seats, which are extremely well-padded (almost too well-padded! I had to move several pillows away so that I could actually sit comfortably) or fabric-covered chairs without arms. With the booth seats you don’t get much wiggle room before you’re right up against the table, so it might only work for smaller babes-in-arms. With the chairs you might have more comfort with an older breastfeeder. If your child needs a high chair, it looks like the restaurant has plenty in supply – there were at least 7 kids using them when we were there. The kids’ menu is good value at £4.75 for a main and dessert; the offerings are all the usual favourites. It’s 80p extra for a kids’ drink. In total, Wildwood Kitchen gets a 7.75 out of 10 for baby- and toddler-friendliness. Let’s hope they can smooth out their service, and then it’ll be a great addition to Wantage’s places to go with kids. I have been meaning to visit Pierre Victoire (9 Little Clarendon Street, OX1 2HP) for quite a while now, but I’ve always been worried that its cozy (read: non-spacious) interior won’t afford enough room for our massive pushchair. But this weekend as the Baberoo, her Daddy, and I strolled around Oxford looking for a good place for lunch, we decided that we would give it a shot – despite the fact that nearly all the tables were occupied. Sometimes you just really want a confit, you know? With the Baberoo ensconced in her high chair, we ordered from the Prix Fixe menu, available from Monday-Saturday from 12:00-2:30 (a terrific value at £7.90 for one course, £9.90 for two, or £11.90 for three, with a few selections that cost extra). 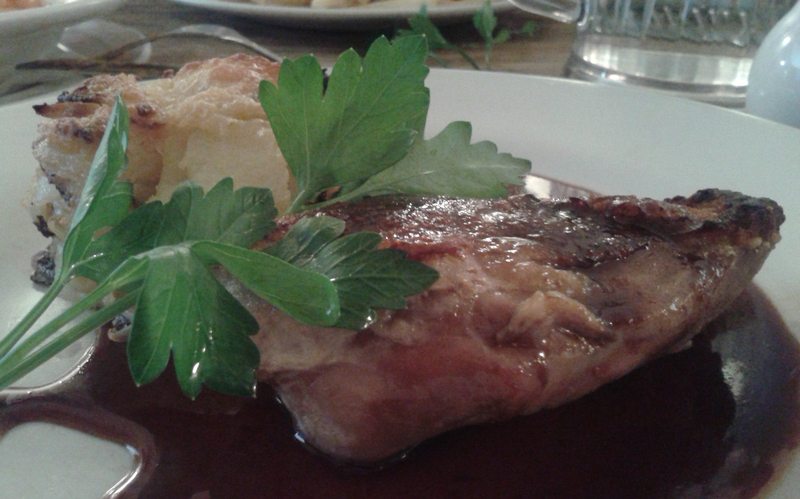 I chose the Confit de Canard à la Framboise, the duck confit with raspberry sauce and gratin Dauphinois. I was very happy with the way the meat fell away from the bone, and the tangy sauce complemented the rich flavour of the duck. The cheesy, buttery potatoes were also delightful. My husband enjoyed his steak, and the Baberoo ate quite a lot of her Linguine à la Provençale, the pasta-and-tomato-sauce dish from the kids’ menu (£5.90 for a main plus dessert), plus two little pots of grated cheese. She also wolfed down her ice cream, which had flecks of real vanilla bean, while my husband chose a pleasingly-spiced apple cake. The service couldn’t have been nicer. The maitre d’, who helped us get in with our stroller and parked it in a corner near the kitchen so that we had plenty of room around our table, was charismatic and hospitable. During his many tours of the restaurant floor we overheard him chatting with diners, taking reservations (some from people lunching who wanted to come back for dinner!) and giving advice – including recommendations on how best to get wine stains out of clothing. I think the yellow cardigan in question was actually taken to the kitchen and the wine stains removed! When he came to our table he told us about his little boy, whose favourite food is snails (for the record, right now the Baberoo’s favourite is olives). Our waiting staff were also very helpful and, for the most part, efficient, especially considering that the restaurant remained full far past the lunch closing time of 2:30. I truly enjoyed my meal and the whole experience I had at Pierre Victoire. I will certainly be going back again to try some of the other menu offerings. But how does it rate for baby- and toddler-friendliness? The five categories I look at are menu, space, ambiance, facilities, and feeding – you can find out more about these on my About page. Menu: Classic French dishes usually require the use of both hands to eat, so if you’re looking for something you can eat one-handed while holding a baby in the other arm, you only have a small number of choices when it comes to main courses. The hors d’oeuvres are mosty doable, but for mains the only ones that you could eat with one hand for sure are the quiche and the risotto – although I think I could have eaten my duck with one hand in a pinch. Space: True to the cozy bistrot style, the tables at Pierre Victoire are packed close together and there’s not a lot of room to move around, especially with a stroller. That said, our maitre d’ was excellent at helping us into and through the restaurant and relieving us of the pushchair to save space at the table. 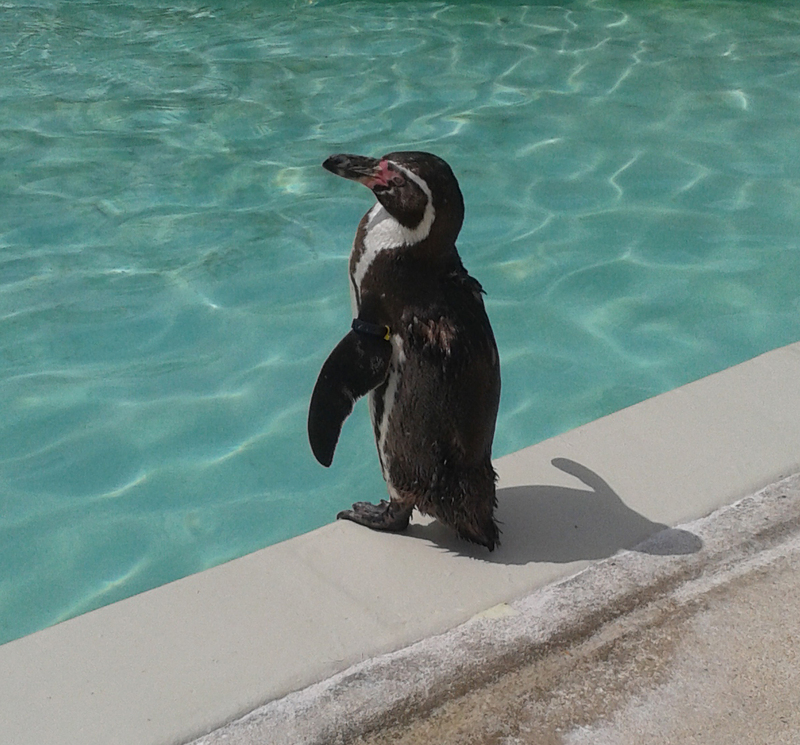 Ambiance: The staff were friendly and spoke directly to the Baberoo. Music, if there was any, was drowned out by the boisterous sounds of happy diners – not a bad thing, unless you have a sleeping little one who is prone to awakening at loud laughter. The decor is homey and unpretentious. Facilities: Quel dommage! Pierre Victoire doesn’t have any baby-changing facilities. It’s such a shame, because there is probably enough room in the toilets to add one if they could re-jig the space a bit (although you would still have to go downstairs to the basement). 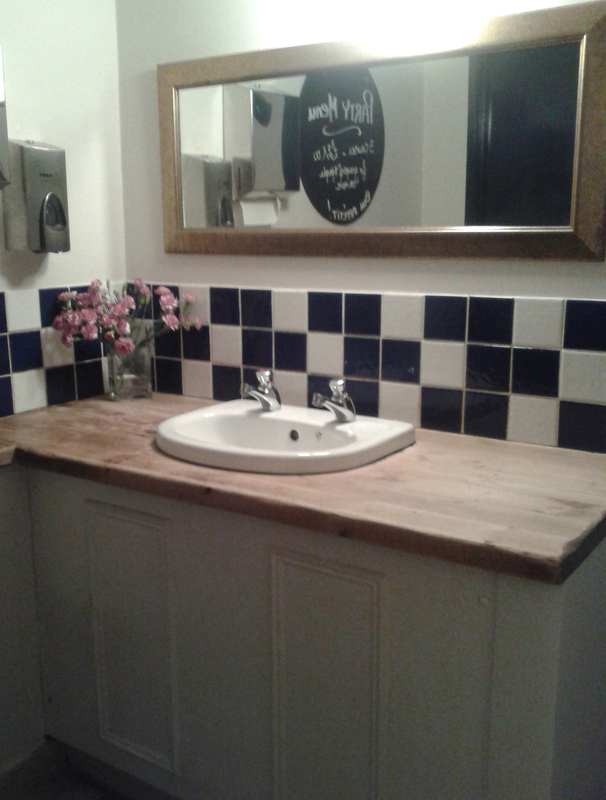 There is a wooden counter where the sink is, but it would only accommodate the smallest of infants. If your little one is any bigger, you’re out of luck unless you want to try the floor. Feeding: Because the tables are quite close together, if you’re breastfeeding you might be a little cramped. The wooden chairs are not especially comfortable, but they’ll do if you need to breastfeed. For little ones who are eating solid food, there are high chairs and a kids’ menu, although some offerings (smoked salmon quiche, chicken and fries) are more suited to older kids’ palates. If your toddler enjoys pasta (and really, who knows one who doesn’t?) the linguine with tomato sauce will do fine. In total, Pierre Victoire gets a 6.5 out of 10 for baby- and toddler-friendliness. The mark is necessarily lower because of the lack of baby-changing facilities, but it’s no reflection on the food, which I thought was excellent. I would say that it’s more of a place for parents to enjoy on their own, rather than with their little ones, but if you are fine with no changing facilities then by all means go with your babies and toddlers. 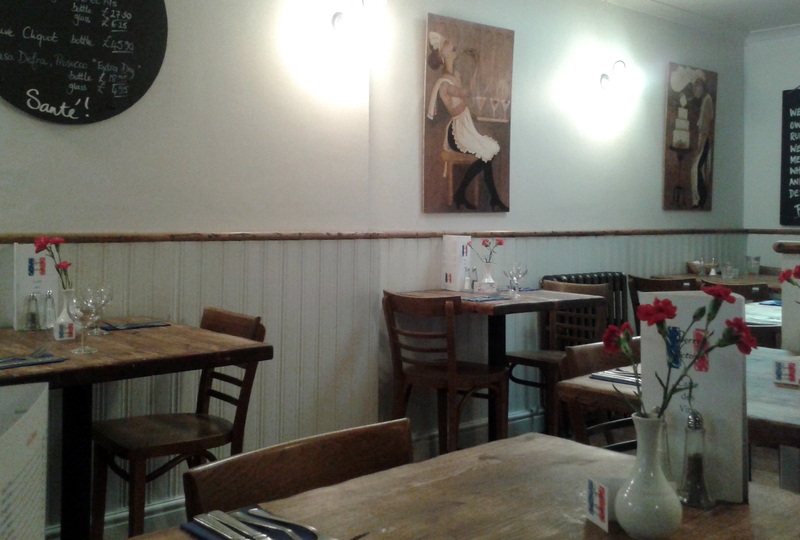 The staff will help you out and you can all enjoy the French fare together. Personally, I can’t wait to come back here on a date alone with my chéri so we can enjoy a whole leisurely 3-course dinner. 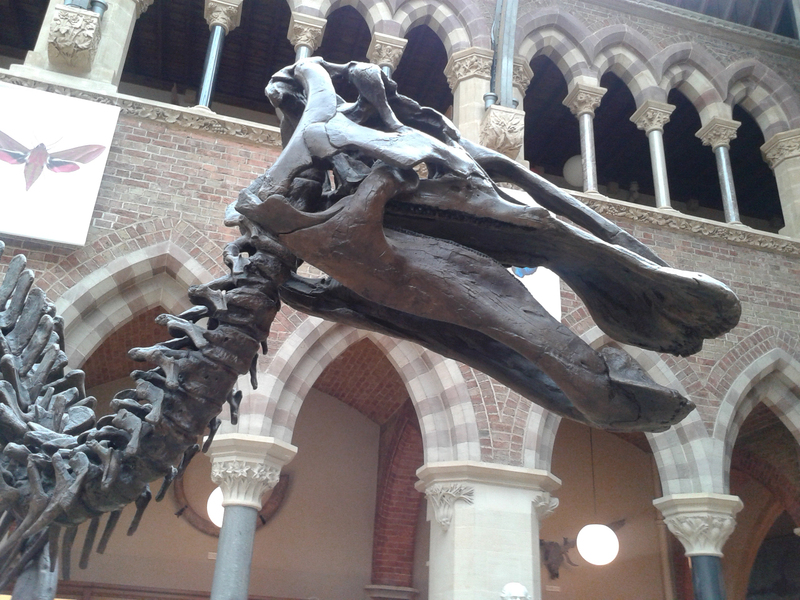 The Oxford University Museum of Natural History (Parks Road, OX1 3PW) re-opened in February 2014 after 14 months of closure, with a restored glass roof and a new café in the upper gallery. The Baberoo and I have visited a couple of times since then, once with friends during a quiet term-time lunch hour and once during the height of the school holidays. There are some fabulous touch-and-feel areas in the museum that babies and toddlers can enjoy, including tiny Mandy the Shetland Pony (an example of taxidermy so adorable that I wanted to stroke her as much as all the kids did; I’m surprised her coat isn’t worn down by all the petting she gets) and two huge tables of touchable specimens. The Baberoo especially enjoyed the stuffed fox, owl, and wallaby. 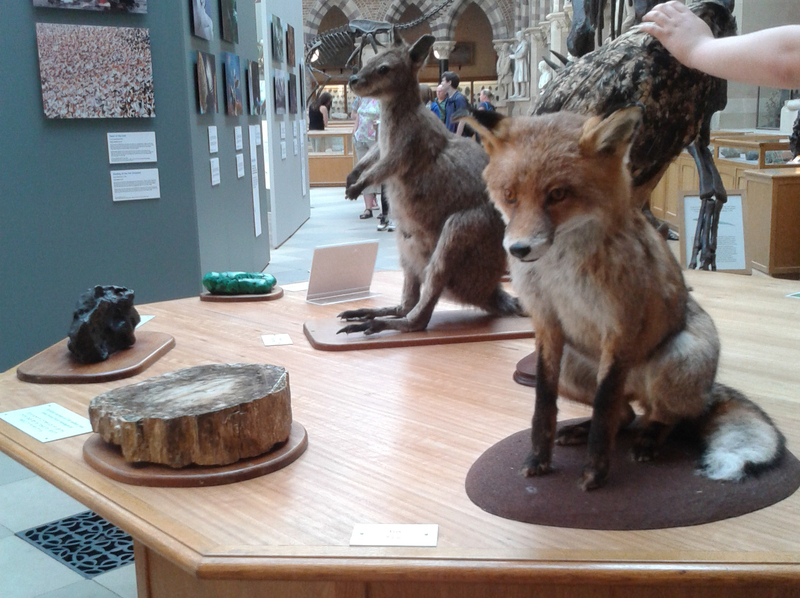 The tables are at adult height, so you will have to hold your baby or sit them right on the table to touch the specimens. If your little one is toddling around, they’ll have fun running around the museum spaces; just be careful around some of the dinosaurs and other skeletons, which are very easy to reach out and grab for despite the signs warning that they are delicate and not to be touched. For some reason, every toddler I know who has visited the museum is obsessed by the Victorian iron grates on the floor (although I expect that their obsession will shift to dinosaurs by the time they’re preschoolers). The Baberoo spent a lot of the time running from grate to grate, although she did pause to point out some eggs and animals in some of the glass cases. One way in which the museum could do better is by improving the signs around the building’s exterior directing you towards the stroller entrance. Signs in different places give conflicting information and the entrance for buggies and wheelchairs is not obvious at all. You could walk from one door to another several times without finding the way in. 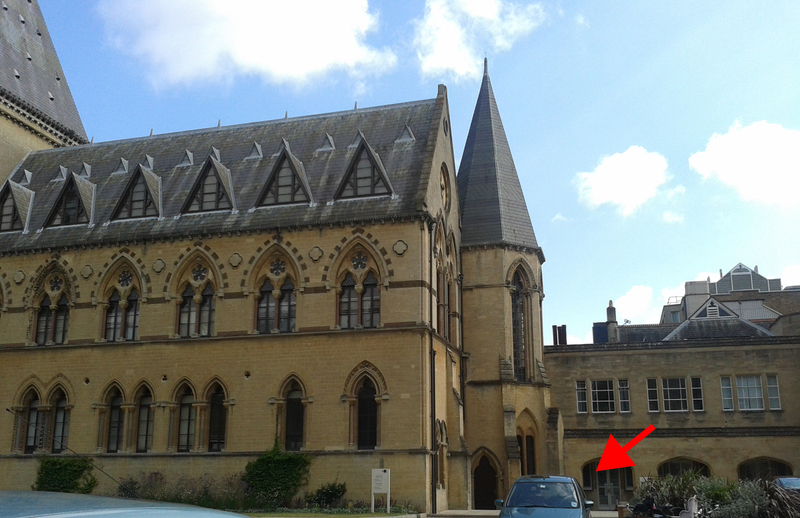 The picture below shows you where to enter – it’s to the right of the main building, at the first rounded archway. You go in through a door on the left when you enter the archway (you can’t see the door in the picture, but the red arrow points in the correct direction). You then need to turn to the right, go down a corridor, turn left, and take a lift up to the main level or the upper galleries. We have enjoyed our visits to the museum and we’ll continue to go back in the future. The experience is limited at the moment to the touch-and-feel specimens and the intriguing floor grates, but as the Baberoo gets older she’ll begin to be interested in more of the gallery content. The museum is geared more towards families with school-aged children, but babies and toddlers will still have fun. So how would I rate the OUMNH for baby- and toddler-friendliness? I usually rate an attraction on an 8-point scale rather than a 10-point scale, since there may not be any scope for the ‘menu’ criteria to be evaluated. However, since the OUMNH has a café and I’ve eaten there, I’ll use my regular 10-point scale instead, with the five criteria of menu, space, ambiance, facilities and feeding (see more about these criteria on my About page). Menu: The café – run by Mortons, one of Oxford’s independent sandwich bars – serves mainly sandwiches, wraps, cakes, and other lunch/tea fare. Most of the items are easy enough to eat with one hand if you need to hold your baby with the other. The hummus wrap I had on our first visit was good and fresh; the coffee and walnut cake was a little dry. If your baby is on solid food there are some choices in the café that may work; there are special kids’ meal boxes (although some of the contents may be too ‘grown-up’ for some babies and toddlers). Signs in the café ask visitors to please not bring their own food to eat, but on our first visit I ignored this rule, having brought some snacks for the Baberoo. I was pleased I had, because she didn’t want the porridge that I bought her from the café. I think you can probably safely bring things for young babies and toddlers without the museum minding too much. There is an abundance of high chairs for little ones. 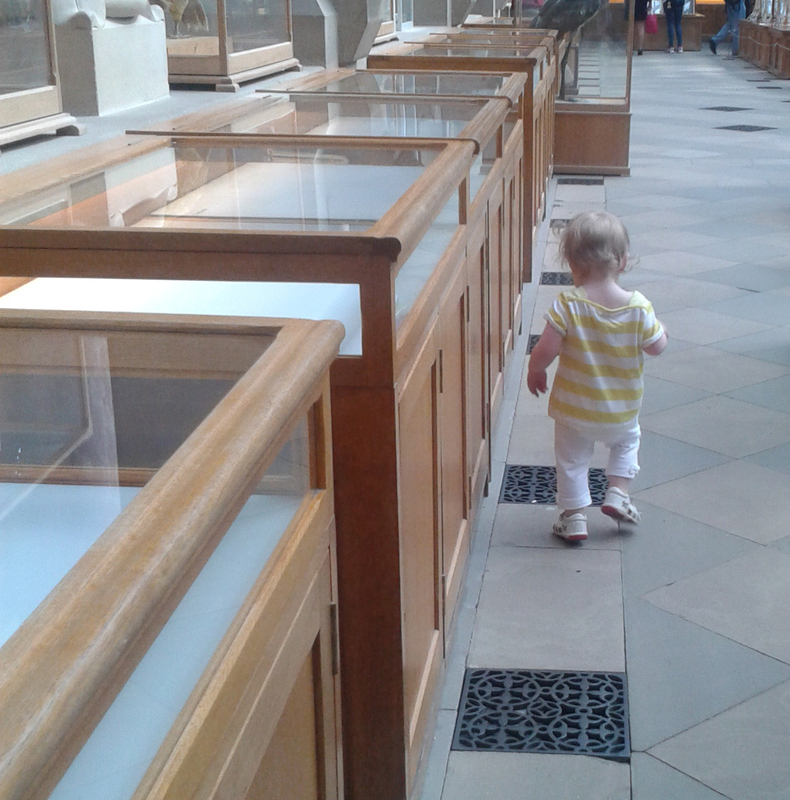 Space: The aisles and spaces within the museum are wide and roomy enough for any stroller, even a double buggy. (Amusingly, they were built this way to accommodate Victorian ladies’ crinolines!) You’ll have no problem manoeuvring your buggy anywhere within the gallery spaces. The café might present more of a spatial challenge; it’s in the upper galleries so it’s narrow and long. When it’s full people tend to station their buggies, high chairs, or an extra regular seat at the side of their table, using part of the aisle. The lift, which you will need to use in order to get from the stroller entrance to any of the gallery spaces, is quite small and narrow. Ambiance: This is a really family-friendly museum; they understand that families are one of their primary audiences. There’s a welcoming feeling, and the wide-open spaces and great lighting from the high glass roof make it feel a little less crowded even when it’s chock-full of people. Babies and strollers are made to feel welcome. Facilities: There is a huge baby-changing toilet near the stroller entrance; it has masses of space and a very large pull-down changing table. The room is clean and fresh-smelling. Since this bathroom is located on the lower ground level you will need to use the lift to get to it (unless you’re using it when entering or leaving the building via the stroller entrance). According to the museum’s website there are also disabled toilets with baby-changing facilities near the main museum entrance. Feeding: There are chairs scattered around the museum; if you’re breastfeeding you may be able to find a chair in one of the quieter gallery spaces. They are padded and don’t have arms so they will probably work well for comfort. Little ones who are eating regular food can partake of the café’s offerings; since it’s a museum obviously no food is allowed in any other area. 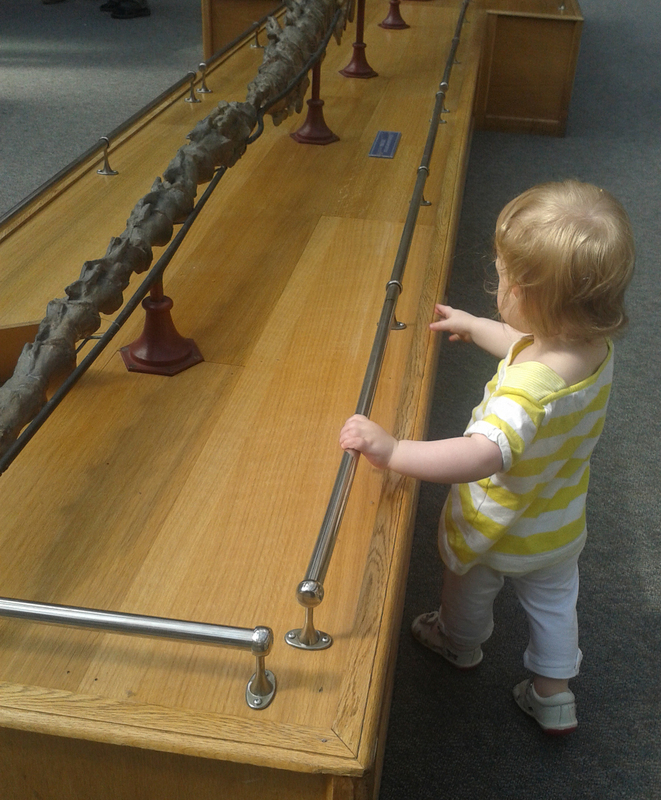 For baby- and toddler-friendliness the Oxford University Museum of Natural History rates an 8 out of 10. Little ones will have fun exploring the museum’s touch-and-feel activities, and when they’re older they’ll get even more out of it. My advice is to start them young!